Gerald P. Koocher, PhD, earned his doctorate in clinical psychology at the University of Missouri. He serves as Provost and Senior Vice President for Academic Affairs at Quincy College in Quincy, MA. 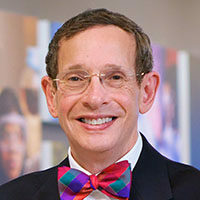 Prior to moving to Massachusetts in 2018, he was Professor and Dean of the College of Science and Health at DePaul University in Chicago. Previously, he was Professor of Psychology and Associate Provost at Simmons College, Boston. He has also served as Chief of Psychology at Boston’s Children’s Hospital and Judge Baker Children’s Center, and as Associate Professor and Executive Director of the Linda Pollin Institute at Harvard Medical School. Currently Editor of the Ethics & Behavior journal, Dr. Koocher previously served as Editor of the Journal of Pediatric Psychology. He has published more than 350 articles and book chapters and authored or edited 17 books including Ethics in Psychology and the Mental Health Professions, the Psychologists’ Desk Reference, and The Parent’s Guide to Psychological First Aid. Elected a Fellow of twelve divisions of the American Psychological Association and the American Association for the Advancement of Science, Koocher earned five specialty diplomas from the American Board of Professional Psychology (Clinical, Clinical Child /Adolescent, Family, Forensic, and Health Psychology). He holds active psychology licenses in Illinois, Massachusetts and New Hampshire. He served as Treasurer (1995 – 2005) and as President of the APA (2006). He currently serves as Chair of the Board of the American Insurance Trust.